Davenport, Iowa (Sept. 12, 2015) — Two longtime Speedway Fire-Rescue (SFR) volunteer firefighters, a husband and wife who have protected and aided hundreds of area racing competitors and Quad City Air Show participants over the years, now need some help themselves. Scott Bohannan, SFR’s president, and his wife Karry, SFR’s treasurer, were hospitalized with smoke inhalation and suffered a huge loss when their portion of a duplex they lived in with their son Brent at 3rd and Oak in Davenport burned Sunday night, Sept. 6. The Bohannans, who have now been released from the hospital, were able to get out of the house with just the clothes on their backs. 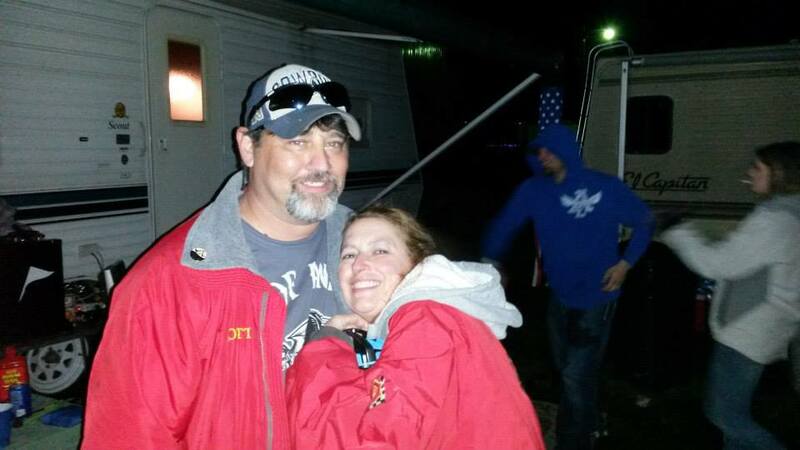 1) SFR members will sell 50-50 tickets and/or accept cash donations to benefit the couple at upcoming stock car races they cover. 3) SFR and Mitch Swinton, with Lil’ Racer Car Club, are making Yankee Dirt Track Classic hats to sell for $15 each at Farley Speedway during their 38th annual Yankee Dirt Track Classic. All of the proceeds from the hat sales will go to Scott and Karry Bohannan and their family. Hats will be available throughout the Yankee Dirt Track Classic. There are several different styles: farmer style with four panel vents and a plastic adjustable strap, all in navy blue; and baseball style with a cloth adjustable back, in black and red; and the fitted style S/M and L/XL, in black. Please make all checks payable to the Bohannan Family Benefit or the Bohannan Family. 5) SFR is collecting clothing for the Bohannans and their son Brent. Sizes for Scott: men’s XL or XXL shirts, 38×34 jeans and 2XL jogging pants; For Karry: women’s medium or large shirts and size 7 pants; For Brent: men’s large shirts and 32 pants (longs). Call Karri Coyne for more information: (563) 370-6446. SFR is a non-profit 501C3 organization based in Davenport. Roughly 50 volunteers, who are trained in firefighting, vehicle extrication and emergency medical service, serve at a drag strip and more than half a dozen auto race tracks in eastern Iowa and western Illinois each year from April through October. They also work at the annual Quad City Air Show each year in Davenport. For more information, contact: SFR Capt. Karri Coyne, at (563) 370-6446, or at karri.coyne@yahoo.com or speedwayfirerescue@yahoo.com. It’s been 10 years since Hurricane Katrina hit New Orleans. Ten years since Jeff and Kathy Fox had moved what possessions they could to the second floor of their house to ride out the storm. 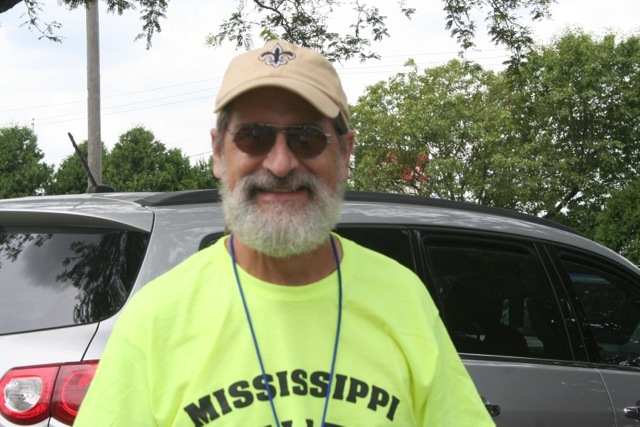 Jeff Fox (pictured) recalled his experiences when we spoke at the Mississippi Valley Fair. He was in town to assist his brother Bob, the fair manager, during the annual event. Katrina arrived on Monday, August 29, 2005. A handyman by trade, Fox had been putting plywood over other people’s windows, then his own, for days before Katrina hit. The Foxes got late notice about a mandatory New Orleans evacuation. But any thought they had of leaving vanished when they turned on the television and saw clogged highways. Lake Pontchartrain’s levees broke right after the storm, allowing it to empty into New Orleans. Crews used sandbags to try to fill the breaches but were unsuccessful. Fox said he heard someone on the radio reporting that the levee had broken and nothing could be done, that people would just have to wait until the water level in the city and the water level in the lake equalized. While New Orleans was flooded, Fox said it was the area east of the city that received the brunt of the hurricane. After Katrina hit, Jeff Fox went outside and saw that there was about a foot of water in the street in front his house. He figured it was from the rain and moved his vehicles to a higher elevation. But then he started to see ripples in the water on the street, and that was frightening. It meant the water level was quickly rising. He paused to gain control of his emotions. “I have trouble talking about it,” he admitted. The couple were stranded on their second floor for about a week with access to the outside only via a second-floor deck. Civilians came by in motorboats, Fox said, but they only picked up people they knew. Helicopters later flew overhead, and Fox put some Day-Glo color staff T-shirts from past Mississippi Valley Fairs on his deck and painted messages on them like, “Hotel Rwanda” and “Beam me up, Scotty.” But they did not result in a rescue. One concern was the couple had to leave their young cat, Ching, behind. But they had filled the bathtub full of water and left plenty of food for him. When rescued, the Foxes were taken to a dry place and dropped off. Then they were escorted to the back of a windowless panel truck, which was driven around for three or four hours. Already there were people who had been evacuated a couple days prior from the flooded St. Bernard Parish, which, said Fox, is low in elevation and close to the Gulf. In downtown Houston the bus went to the Stennis Center, where its passengers were to be processed. Fox said someone who may have been a sheriff got on the bus, looked down the aisle and said, “I just want to tell you people, I know what a criminal looks like.” The man then carefully looked everybody over. The Foxes did just that and kept on walking. They were a block away before they looked back, and they felt a sense of freedom. Worried about Ching, the Foxes had called and asked the Society for the Prevention of Cruelty to Animals to rescue their cat. But would-be rescuers apparently were noisy, and the cat hid from them. When the rescuers left, they left the house’s front door open, and Ching had gotten out. Jeff Fox worked for a few days at an animal rescue facility in Baton Rouge, hoping he’d come across Ching. But he didn’t. Fox wanted to return home to look for the cat but only the media and animal rescuers were permitted to enter New Orleans. But I had a plan to help him. I was working fulltime at WOC Radio News back then, and Fox had allowed me to interview him in the weeks prior for some news stories about Katrina. So I decided to, you might say, make him part of the news team so he could get back home. I created a photo identification card that said he was a WOC correspondent, which, in reality he was at the time. With his news media ID in hand, Fox was ready to re-enter New Orleans and look for Ching. But it turns out he did not need it. He had affixed a large pet rescuer sign on the front of his rental car and was permitted back into the city with no problem. Ching, now age 12, is well. And he is a survivor. Fox notes that the feline survived not one but two hurricanes because the tail end of Hurricane Rita tagged New Orleans a couple weeks after Katrina had hit. And remember those colorful T-shirts Jeff Fox had displayed in hopes they would lead to a quicker rescue? The T-shirts were shown by CNN’s Anderson Cooper in one of his reports from New Orleans. Fox recognized them while watching TV. He could tell where the reports had originated, later drove to that spot and found the T-shirts on the ground. Copyright 2015 by Phil Roberts, CreatIive Enterprises. This piece ran as a column in The North Scott Press, Eldridge, Iowa.